In a 4-qt saucepan over medium-low heat, melt the butter. Add the leeks, potato, apple, salt, and pepper. Stir well, cover, and cook over medium-low heat for 5 minutes. Add the chicken brothe and bring the mixture to a boil over high heat. Reduce heat to low and place the lid on askew, so the pot is not covered completely. Cook until the potato and aple are very tender, about 30 minutes. Add the half-and-half. Puree in batches in a blender until smooth. Refrigerate several hours or overnight to chill thoroughly (I like to serve this soup hot sometimes too). 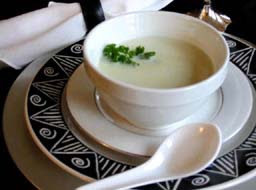 To serve, ladle the soup into bowls and sprinkle with the chives.